Everyone's got a book that just totally grabs them. A book that felt like it was yanking their shoulders down and sticking itself up close to it could yell in their face, "LISTEN TO ME THIS IS IMPORTANT." If you haven't found that book yet, then I advise you keep looking because there honest to goodness is at least one of those for everyone. This, for the record, isn't that book for me. 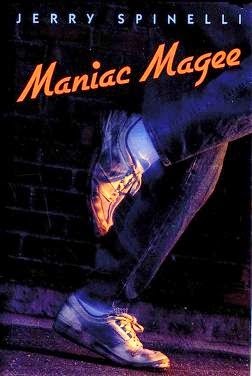 I like Maniac Magee, but I read it for the first time this weekend, at the behest of someone who does love this book that much. And I can see why. Because for all that I'd never really heard of it before now, it's a really good book that treats with some of my favorite topics and sticky issues, while still managing to be a light-hearted fun kids' book. 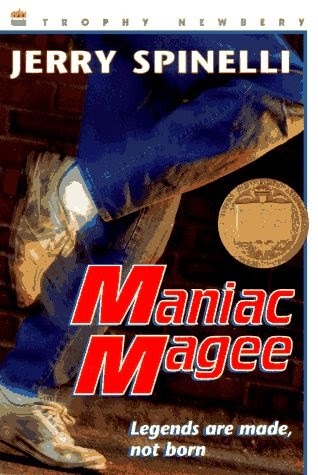 So what is Maniac Magee all about? Well, race relations for one thing. Also homelessness, child neglect, emotional abuse, starvation and suicidal ideation, death, and other super fun topics. And yet, for all this, it is a really fun book to read, and surprisingly quick. I got through it in about two hours, and it's not like I was weeping my way along. 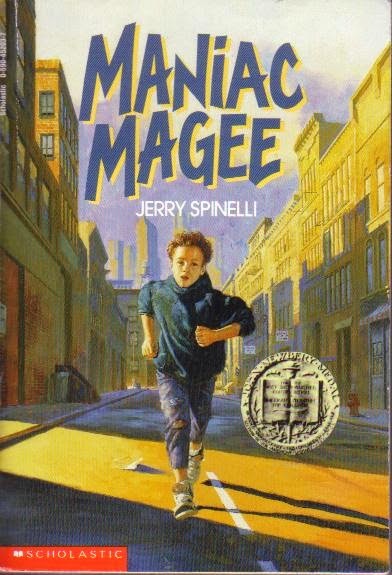 The book, by Jerry Spinelli, who wrote a whole slew of preteen books like this that I have similarly not read, follows the adventures and legend of Jeffrey Lionel Magee, a white twelve year old whose home life is pretty crummy. His parents died in a tragic accident when he was little, and he's spent eight years living with his alternately neglectful and emotionally abusive aunt and uncle since then. Until, one day, he just can't take it anymore, and he runs away. Very literally. He just sprints out the door and never comes back. A year after that fateful day, Jeffrey Magee turns up in the quiet but deeply unhappy town of Two Mills, Pennsylvania. Because he's new there and has no adult in his life telling him what to do, Jeffrey steps in it pretty quickly, accidentally uncovering the simmering race tensions between the white side of town and the black side. To him, he has no idea that there are two sides of town, because he's never been there before. But to everyone else, he's breaking the unwritten rule of Two Mills. And it has to stop. The plot of the book, though it sounds dire in what I outlined up above, is actually really light and sweet. Insofar as a book that deals with these issues can be light and sweet. Jeffrey, who is quickly nicknamed Maniac for the way he casually disregards all the social cues he just doesn't know about, lives homeless in the town for a little while before being taken in by the Beales, a very kind black family. He absolutely loves living with them, and they love having him, but some other members of the black community in town see him as an invader. It's not enough that the white community has half the town, now they have to start colonizing the black side too? When the anger starts to spill out against his new family, Maniac runs away, and spends the winter living in a equipment shed outside the park, making friends with the park keeper and teaching him how to read. But then the keeper, Grayson, passes away (presumably of old age), and Maniac is once again out of a home. From there he falls into a deep depression, nearly dies, but rouses himself in time to get involved with a white family - the McNabs. In contrast to the loving and extremely functional Beale family, the McNabs are a whole passel of aggressive, mean, racist men. Maniac doesn't really like staying with them much, but he does because he's afraid of who they'll become without him there to mitigate their worse tendencies. This is where the underlying tensions about the black and white communities of the town come to the forefront in the story. While the black community wasn't happy to see Maniac when he was living with the Beales and "invading" their side of town, the white community is even more hostile. George McNab, the father of the family, is a member of a legitimate hate group, and spends his days building a bunker in the house for when the black community inevitably riots and tries to destroy him. The idea that they might not because they don't care literally never occurs to him. And so it's up to Maniac to try to bring reconciliation to this town. Which he does, but not in the way that anyone really expects. That's the thing about this book, the part I most appreciated. 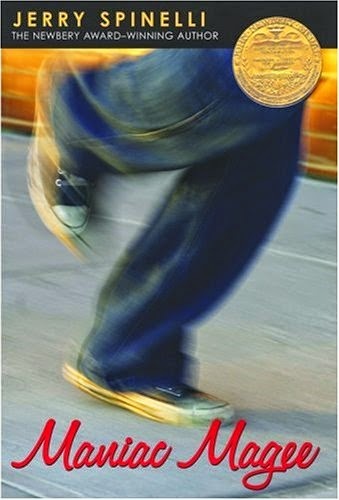 While it would be easy to write a narrative where Maniac Magee helps racial reconciliation in this town because he's so awesome and so good at everything, it's actually worth noting that every time Maniac actually tries to make people get along better, he utterly fails. When he tries to get more comfortable with the black kids in his neighborhood, he actually manages to spur resentment by being a lot better than everyone else at football. When he tries to get along with the white kids, he shows them up by being amazing at baseball. When he runs a footrace and outpaces everyone they've ever seen, he just ends up with everyone pissed at him. Same too when he unties an untieable knot and just gets everyone mad. Every time that Maniac actively tries to get people to get along he screws it up. It's not until he stops trying and just lives his life that people get on board. Nothing in this narrative comes too easily. It's never like BOOM! The white kid shows up and magically everyone gets along all of a sudden. In fact, for a while there it looks like Maniac's presence has actually made things actively worse for a fair number of people. The crucial moment in the story, the one that sold me on the whole narrative, is when the one of the little McNab boys, who've been raised by a white supremacist father, is trapped out on a railroad bridge. Maniac happens to be running by with his friend from the black side of town, Mars Bar, when they see him and beg for help. Maniac is a really fast runner, so he can totally run and get the little boy before the train comes, right? Uh, no, as it turns out. He can't. And that's the turning point of the whole story. Maniac, after a whole book of bending over backwards trying to save people and help them and just make them all get along, doesn't save the little boy. Not out of malice or ill-intent, but because he very literally can't. When he sees the train, he goes into a dissociative state, with all of the trauma that's piled up since his parents died (in a train accident) hitting him at once. They find him hours later on the other side of town. In the end, Maniac helps people by not helping them and forcing them to get along for themselves. Because that is what happens. Mars Bar, who doesn't dissociate, is still there, and he saves the boy, and then takes both of them home to his family. His family, of nice kind black people, shows the little boys the first true parental affection they've ever really had, and it's almost impossible to send them home at the end of the night. It doesn't fix everything immediately, but all of a sudden, the two sides of the town are talking to each other again. In the aftermath, Maniac finally gets to go home and live with the Beales, because the town (both sides) can finally see him for who he is: a scared little boy who needs a family. It's a great ending and a really great book. Not just for the way it deals with racism, but also for the way that it insistently tackles a lot of really difficult issues without ever feeling preachy or heavy. The idea that your family does not have to be the people you are biologically related to. The idea that home is where they call you in to dinner. Just the simple concept that you can have more impact on the world by being vulnerable than by all the feats people can dream up. It's a really good book. I mean, there's so much detail here. Maniac runs away from his aunt and uncle, who never ever spoke to each other and preferred to ignore each other, screaming about how they just needed to talk, only to wind up in a town with two sides that never speak and prefer to ignore each other. Of course he tries to fix it! Of course he absolutely can't stand the status quo. And there's the detail about making it explicit in the narrative that Maniac is a white boy. At first I was a little miffed about that, because I love a book with a protagonist that is anything other than white, but as I was reading, it made morse sense. Maniac has to be white for the story to work, because a lot of the story is about the white people on the other side of town realizing that the black families are just like them. And if the story is about a little black boy who gets taken in by a kind white family, well, we know that story. We've heard it a lot. It's nothing new. It's The Blind Side. And it wouldn't have the power to spur on racial reconciliation in the town. Because, and I love the book for making this clear without beating us over the head with it, the white side of town has more power. It's made perfectly clear that when the black community revolts against having Maniac there, an idea that the white community will use him as a tool for "gentrifying" and moving into the black side of town, they're not entirely wrong. The white side of town has more power. 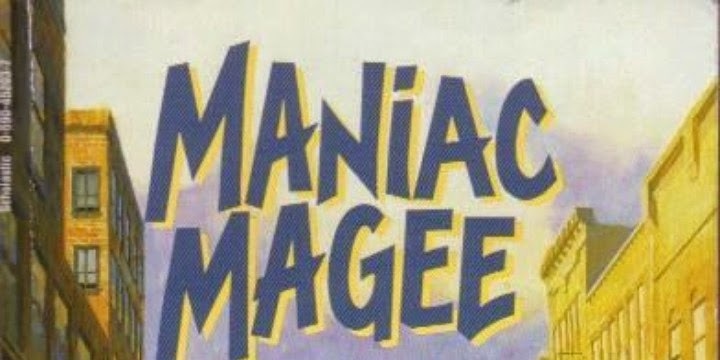 Maniac, as a white kid, is able to come live on the black side of town in a way that a black kid absolutely would not be able to come live on the white side of town. It's a stupid truth, but it is true. That's why the ending, with Mars Bar, who is black, rescuing two racist little white boys, has to be the way it is. Maniac couldn't save them, because then it's just a white kid saving two more white kids. And it stinks that it took a superhuman feat by a black kid to bring the town together, that it had to be the black community reaching its hand out first, but it's true. That's how it has to work for the message to really stick. And, when it comes down to it, it's a book I wish I had read when I was twelve. Not that it was bad reading it now, but I wish I'd had more years with this book, more years to appreciate it. There's so much here that I've barely scratched the surface. Which is funny, because the book itself is less than two hundred pages long. But I do. I wish I'd read it earlier, and I know that this is going to go onto the list of books that I force all the children I watch and all the children I someday have to read. Because they need to understand this, all of these issues. That family is more than just who you're related to. That race is by and large a social construct but that doesn't in any way negate the experiences of people whose race has deeply influenced their lives. That homelessness is an endemic problem but that compassion is the key to helping anyone. That you can't ever force two people or two groups to talk, but you can make them want to, and sometimes that's enough. Long time reader of your blog, first time commenter. First, please let me say thank you for all the wonderful content. Second, I read this book as a child, but I did not realize how recently it had been written. When I was reading it at the age of ? (older than nine, but under than 11), it seemed like the book was from A LONG TIME AGO, when it had only been published one or two years prior. I haven't read it in years and have lately been wondering how it holds up. Thank you x 2 for this review. Huh, you're right. It is relatively recent. (I had to go look it up, because you got me curious.) It's held up really well - I think it's the writing style that makes it feel older. Spinelli wrote it to sound like a legend, and he succeeded quite well.